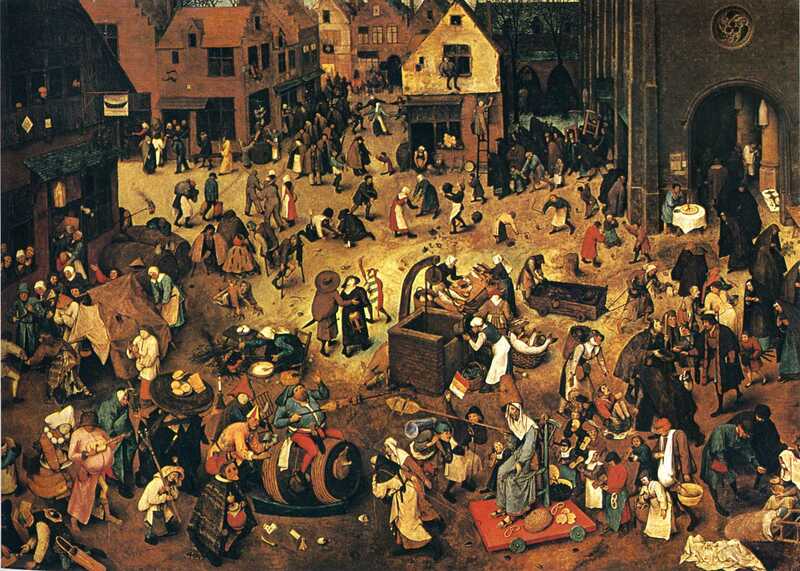 The Fight Between Carnival and Lent is an oil-on-panel work painted by Pieter Bruegel in 1559. He was an innovative Flemish Renaissance painter and printmaker, known for his sweeping landscapes and peasant scenes. The painting depicts a common festival held in the Southern Netherlands. On the left side of the painting there is an inn, and in the right side of the painting there is a church. The juxtaposition is meant to illustrate the two sides of human nature: pleasure and religious chastity, and the contrast between the two. The battle enacted between the figures Carnival and Lent was an important event in community life in early modern Europe, representing the transition between two different seasonal cuisines: livestock that was not to be wintered was slaughtered, and meat was in good supply. The battle between Carnival (“Don Carnal”) and Lent (“Doña Cuaresma”) is also one of the most famous passages of the Book of Good Love (El libro de Buen Amor, in spanish), a semi-biographical account of romantic adventures by Juan Ruiz, the Archpriest of Hita circa 1330, considered to be one of the masterpieces of Spanish poetry.